Foamo kills it. I just heard “Moving It Over Here” the other day and was blown away. I have heard MSTRKRFT drop this numerous times live and it is a total dancefloor killer, complete with a Crooker-esque bassline and a vox sample that everyone will sing along to. And this kid is only 21 and was sought out by JFK himself! “It’s not often that talent comes rising through the ranks fully formed, undiluted, and with as much potential as Foamo (aka Kye Gibbon). For a 21 year old from the sleepy town of High Wycombe, it’s quite an achievement to hit the ground running with his debut single ‘Moving It Over Here’ on Cubism Records, surprising established producers old enough to be his dad with the depth and quality of his engineering skills, never mind the absolutely huge bassline! ‘Everything Cool’ is another instant dancefloor killer from Foamo carrying on from where ‘Moving It Over Here’ left off. It’s teasing vocals and a massive bassline hook has ensured it’s been in the DJ sets of Crookers, Kissy Sellout, Midfield General, Lee Mortimer, Bloody Beetroots, HiJack, Drop The Lime, Trevor Loveys, Detboi, Boy 8-bit, Loose Cannons, Stupid Fresh, Nic Sarno… the list goes on! ‘Rockerman’ was dropped by Crookers on their recent essential mix for Radio 1 and sees Foamo displaying his production versatility on this house / dubstep fusion. Perfect for adding a bit of spice and unpredictability to a set and still with enough oomph to get the crowd skanking! I shall be seeing Sebastien Tellier in Toronto next week, Aug 4 at the Mod Club. I am super excited 🙂 So see you all there! Here is a fun little mix of songs that Sebastien put together. Quite pop. Justice did a mix for the latest Dior Homme Spring Summer 09 fashion show in Paris, just like Daft Punk did a year or so ago for Louis Vuitton. They dropped a new track. Classic Justice sound, epic piano chords, distorted arppegiated harpsichord, super compressed drums, filtered out synth, all the proper elements of a Justice track. Reminds me of Rondo Veneziano or Yellow Magic Orchestra with some SebastiAn elements. Any info on this would be great. Thoughts? “Daryl Hall’s free web-show, Live From Daryl’s House, has become a destination for music fans seeking the latest in up-and-coming artists. 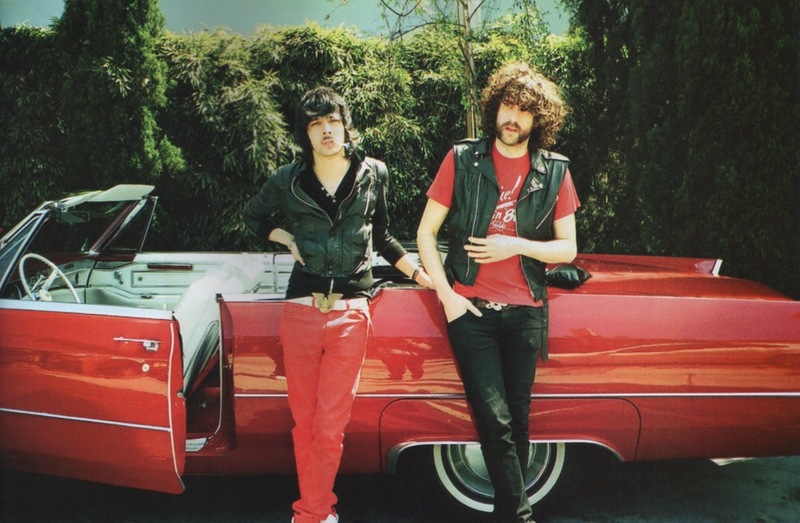 The 10th edition, which can be seen on www.livefromdarylshouse.com, starting August 15, will feature highly touted, two-man Canadian electrofunk outfit Chromeo. NT89 produced this theme song/cover for the b-log and is getting shirts made. Peep it. Some big changes are on the way in the next few weeks for Asian Dan so be on the lookout. Thanks for reading and for all the love. Daniel from Cazals sent me this cover of Digital Love that they played live on Radio 1 for the BBC a few years ago. Daniel feels it is a weak cover but I think that it is a great “rock” cover of this tune. They even nail the raging guitar solo at the end. Goes to show you how well Daft Punk’s songwriting is and that their music translates well into any genre. God bless Daft Punk. Get, get, get, get, get, get down.Up, Up, Up, Up, Down, Down.Bounce, bounce, low, high, bounce, bounce, high, low. I’ll be at the Toronto show, so see you there. I can’t wait for Jean Nipon. Check out Jean Nipon’s Asian Dan Minimix and an interview. Erol Alkan – Live @ T in The Park: Drops the new Soulwax Remix of MGMT’s "Kids"